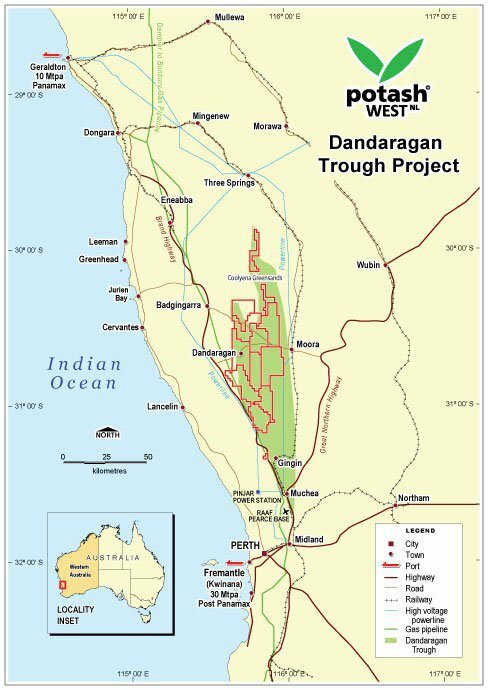 Potash West (ASX:PWN) has facilitated a corporate manoeuvre which will enable its South Harz project in Germany funded for drilling, allowing the company to turn its full attention to the Dandaragan Trough Project in WA. The South Harz project is very large, to say the least – it’s a 4 to 5 billion tonne potash exploration target, with grades of 7.2% to 25% K 2 O. There is well-documented previous production from PWN’s South Harz project, and even more on neighbouring properties. Understandably, PWN is itching to start drilling on this project, which will hopefully take it on a rapid pathway to a JORC compliant resource. By partially ceding ownership of the project (PWN will likely own 28% once this recently announced transaction is complete) and backing it into a separate ASX listed vehicle, the company can allow funding for the drilling and ongoing exploration here. PWN has potential to follow a similar growth path, currently capped at under $10M – however success is no guarantee here, PWN remains a speculative stock. Finally, this “K-Max” technology also extends to IP relating to lithium production – this is the “L-Max” technology, which PWN holds a 25% stake in. In addition to the value of PWN’s phosphate and potash projects, both the K-Max and L-Max technologies can hopefully generate solid royalties for the company over time, as they both assist in the processing of fundamental resources for the globe moving forward – potash and lithium. PWN currently own 55% of a company called East Exploration (EE), with the rest of EE held privately. PWN will own 28% of Davenport, post capital raising, subject to the amount raised. The deal with Davenport allows PWN to keep some skin in the game without taking its eye off the ball. PWN signed a binding term sheet agreeing to cede its entire 55% stake in East Exploration (EE) to Davenport Pty Ltd, a subsidiary of Arunta Resources (ASX:AJR). 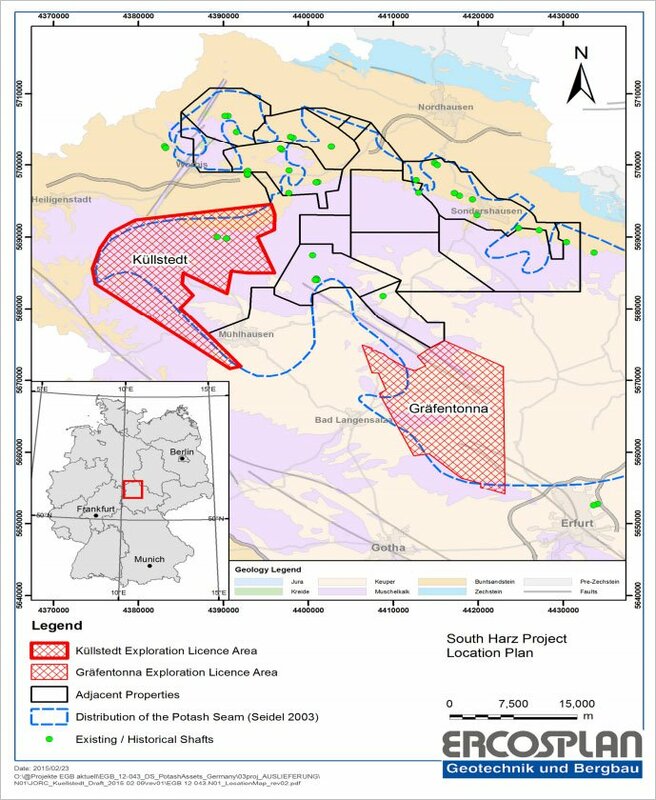 The South Harz Project in central Germany, comprises of two exploration licenses – Kullstedt and Grafentonna. 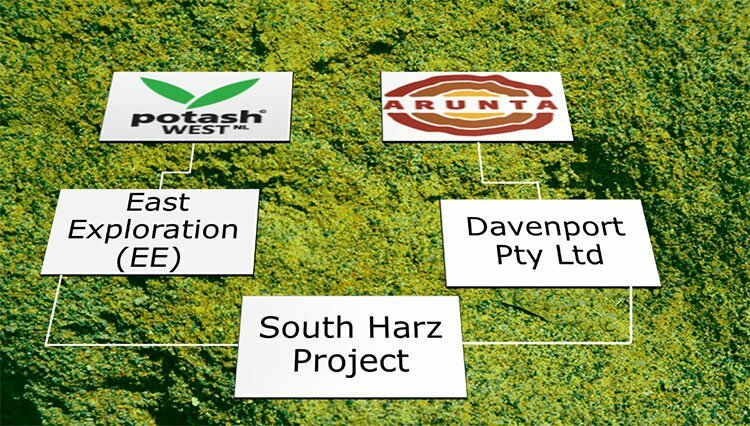 Funds raised will be used to drill exploration targets within the Kullstedt license in the Sotuh Harz project which has an estimated potash exploration target of 4,055-5,141 million metric tons. Target grade ranges from 7.2%-25%. At the time of the release of our first article on PWN, ‘ ASX Explorer Launches into $172BN Global Fertilizer Industry ’, PWN was earmarking a drilling campaign to begin the process of defining a JORC resource. However one question mark was the funding – and now this strategic move has taken place, PWN could rapidly attain a maiden JORC resource at South Harz via a joint-venture. All in all, the deal allows PWN to retain exposure on its German interests without having to throw additional time, effort and expense at exploration. Full terms of the deal are included in this ASX announcement from Arunta Resources. The second tranche of 33M shares will be issued if Davenport completes all required mining approvals and utility contracts required to construct and operate a mine. The deal still requires shareholder approvals from PWN, EE and Arunta but it is widely expected these will be mere formalities. The South Harz project is split into two licenses with a combined area of 457km 2 in the heart of the world’s fifth-largest potash producing country – Germany. A world class infrastructure network exists throughout the region and is being utilised by current potash producers such as K+S, to move finished products to key markets in Europe and offshore. 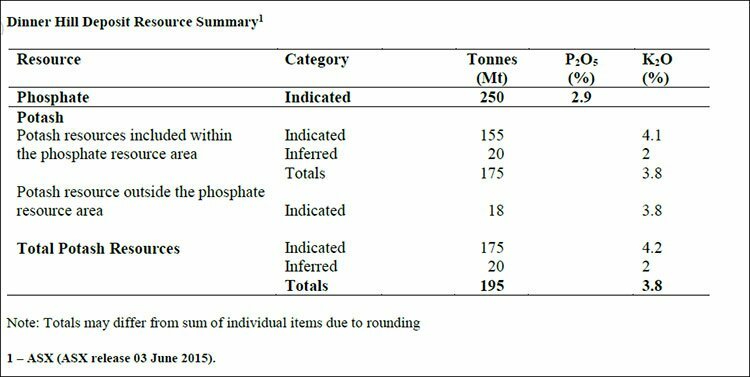 Potash grades seen so far by EE and PWN vary between 10%-18% K 2 O across the project. Given the strong previous drilling results on the project, and high potash production amounts in the surrounding region, PWN is looking to drive this project to production as soon as possible – and that begins with the upcoming drilling. PWN’s main focus in the Dandaragan Trough is the Dinner Hills site, where the company is looking to produce more than 250 million tonnes of phosphate ore. Yet more potash and phosphate potential to this company’s name. PWN’s value-add is not just in its project site(s) but also its technology. Currently, PWN fully owns the intellectual property rights to the ‘K-Max’ process – an efficient way of producing potash from glauconite. The same tech is also being used to produce lithium carbonate from hard rock micas. PWN has managed to secure a 25% stake in the IP which means prospective royalty payments further down the line once the K-Max and L-Max technologies are commercialised by its partners. This is a blue sky tech play which could revolutionise the way potash and lithium are produced globally – and PWN shareholders could be the main benefactors. At the same time, this technology is in its early stages, and there is no guarantee PWN will be able to commercialise it. One of the most attractive aspects behind phosphate and potash fertilisers as a commodity is their longevity. Primarily used in the manufacture of fertiliser products, they are key ingredients which ensure harvest yields are maximised while soil quality is maintained. Fertilisers have a big future ahead with population growth and an expanding middle class in emerging markets such as China and India increasing the need for food in these key markets, and therefore fertiliser. Fertiliser products are ripe to fill the gap between food demand and supply. Already, around 30% of all food produced globally is dependent on fertiliser. The overall amount of food produced globally is much more likely to rise rather than fall – unless we see a sharp decline in the world’s population or the world consumes less food. Both are very unlikely scenarios which means PWN’s operational environment and target market are likely to be resilient. 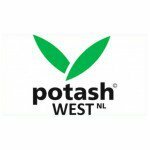 In a recent example of how hot the potash industry is right now, Canadian giant Potash Corp (TSE:POT) offered US$8.5BN in an attempted takeover of K+S (XETRA:SDF), a smaller rival based in Germany. The takeover was rejected on the basis that “Potash Corp’s offer is too low”, according to a K+S statement. This was despite the €41 ($A62) per share offer which equates to a 40% premium. According to K+S estimates, the company is worth in excess of €60 per share. S+K has reported stellar Q2 earnings last week with an operating profit of €179M – a 14% year-on-year increase. At this early stage of its development, PWN is making a compelling case as a long-term investment with leverage to global population growth, greater food/water consumption and dwindling arable land. However, caution should be applied when considering PWN for an investment, as it is a speculative stock.